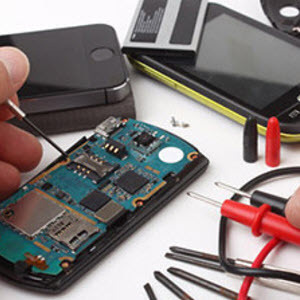 Follow these steps to disassemble the mainboard REMOVING THE CHARGER BOARD The PC Card Connector Module is normally part of the motherboard spare part. The following removal procedure is for reference only. Remove the four (4) screws and then detached the cable connected to the mainbaord (CN11) as shown below. Ensure that the Mainboard is face up. Place the Mainboard in the chassis, left hand edge first to allow the I O Ports through the casing, then lower it into place. NOTE Make sure the I O ports are positioned correctly through the lower cover, and the screw sockets are visible through the mainboard. 3. Replace the RJ-11 cable in the retaining clip on the Mainboard. 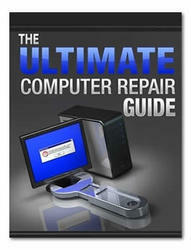 Use the following procedure to remove replace the Motherboard Assembly 5. Remove the five screws that secure the motherboard to the inside assembly frame. 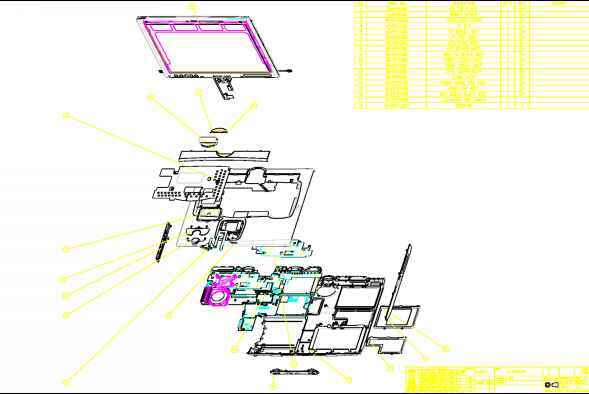 Pull up on the Motherboard Assembly to release it from the inside assembly frame (refer to Figure 6-21). 6. Turn the motherboard over and remove the Keyboard Connection Board. Figure 6-21 Detaching Motherboard from Inside Frame Assembly Figure 6-21 Detaching Motherboard from Inside Frame Assembly 1. Remove the Motherboard Assembly as described in Paragraph 6.5.17. 2. 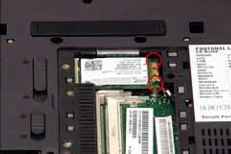 Remove the four screws securing the PCMCIA Module to the Motherboard Assembly (refer to Figure 6-22). Disconnect the Microphone cable from the Mainboard. 3. Disconnect the Bluetooth cable from the Mainboard. 4. 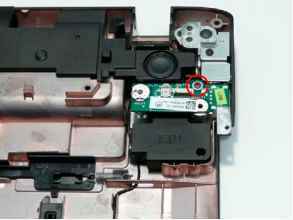 Remove the two screws securing the Mainboard and Fan to the Lower Cover as indicated. Mainboard 5. Lift the Mainboard right side first to release the I O ports and separate the board from the Lower Cover. This utility will display Mainboard Data (MBD) which includes header informaiton, product name, manufacture name, UUID (Universally Unique IDentifiers) and serial number. 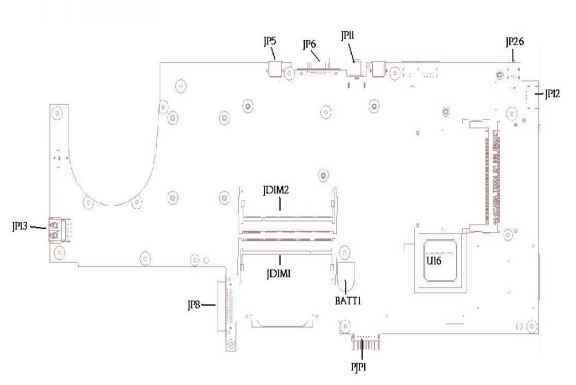 This function can display and create MBD data as well as store those information to LCD inverter EEPROM (not flash ROM). Following are specification for this function. 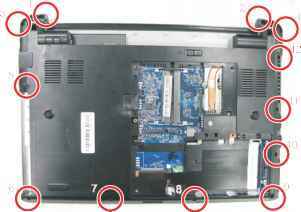 Remove the three screws to detach the system fan from the mainboard. 3. Then detach the system fan from the mainboard. 4. Remove the one screw to detach the mainboard. 5. Push the edge outward in order to release the mainboard from the case. 8. Detach the fan from the mainboard. Disconnect the speaker cable from the mainboard. 3. Disconnect the microphone cable from the mainboard. 2. Disconnect the speaker cable from the mainboard. 3. Disconnect the microphone cable from the mainboard. 4. Remove the four screws that secure tha mainboard. 5. Detach the mainboard from the lower case. 6. Disconnect the power board cable from the mainboard and remove the power board from the mainboard. 8. Disconnect the fan cable from the mainboard. 9. Remove the thermal module from the mainboard. 8. Disconnect the fan cable from the mainboard. 9. Remove the thermal module from the mainboard. Disconnect the speaker cable from the mainboard. 11. Remove the mainboard from the lower case. 2. Release the screw securing the CIR board and remove the mainboard from the lower case. 3. Disconnect the CIR cable from the CIR board to separate the CIR board and mainboard. 3. Disconnect the CIR cable from the CIR board to separate the CIR board and mainboard. 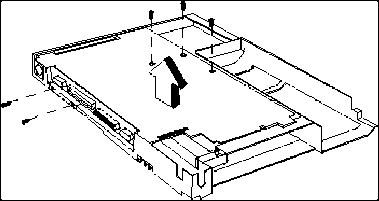 Intermittent system hang problems can be caused by a variety of reasons that have nothing to do with a hardware defect, such as cosmic radiation, electrostatic discharge, or software errors. FRU replacement should be considered only when a recurring problem exists. 1. 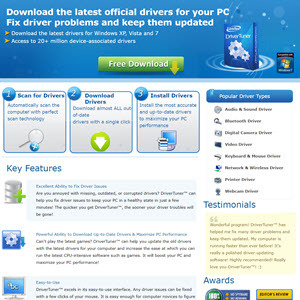 Run the advanced diagnostic test for the system board in loop mode at least 10 times. If an error occurs with the internal diskette drive, reconnect the diskette connector on the system board. If the error still remains If an error occurs, reconnect the connector on the System board. If the error still remains If the internal keyboard does not work or an unexpected character appears, make sure that the flexible cable extending from the keyboard is correctly seated in the connector on the system board. Pull up both sides of the latches to disconnect the FFC from the mainboard. 4. Disconnect the right and left speaker cables from the mainboard. Disassemble the Main Unit ( VGA, Card Reader, Sub-Woofer and Mainboard) 2. Detach the VGA module from the mainboard. 10. Remove the one screw to release the mainboard. 11. Press the PCMCIA button and hold the position to release the mainboard from the case. Reconnect the three FFC cables to the mainboard. 3. Reconnect the three FFC cables to the mainboard. 5. Reconnect the Microphone cable to the Mainboard as shown. 5. Reconnect the Microphone cable to the Mainboard as shown. 6. Reconnect the LVDS cable to the Mainboard as shown. 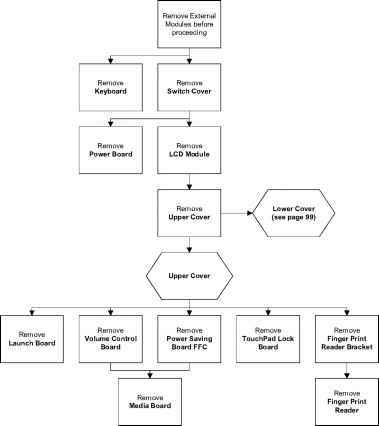 Unlock and remove the touch-pad to mainboard FCC. 2. Detach the Bluetooth module cable from the mainboard. 6. Disconnect the speaker cable from the mainboard. 1. See Removing the Mainboard on page 71. 1. See Removing the Mainboard on page 71. 1. See Removing the Mainboard on page 71. 1. See Removing the Mainboard on page 71. Disconnect the following cables from the Mainboard. Release the locking latch on A as shown. Disconnect A from the Mainboard. Release the locking latch on A as shown. Disconnect A from the Mainboard. 2. Disconnect the Bluetooth to Mainboard cable. 5. Remove the one (1) screw securing the Mainboard to the Lower Cover. Mainboard 6. Lift the Mainboard from the side opposite the connector bracket, then remove it from the Lower Cover. 6. Lift the Mainboard from the side opposite the connector bracket, then remove it from the Lower Cover. 1. See Removing the Mainboard on page 65. 2. Disconnect the Fan cable from the Mainboard. 1. See Removing the Mainboard on page 65. Boot started, check motherboard power is stable. Intermittent system hang problems can be caused by a variety of reasons that have nothing to do with a hardware defect, such as cosmic radiation, electrostatic discharge, or software errors. FRU replacement should be considered only when a recurring problem exists. Turn the computer over and disconnect the following cables from the Mainboard. 3. Turn the computer over and disconnect the following cables from the Mainboard. Release the locking latch on A as shown. Disconnect A from the Mainboard. Release the locking latch on A as shown. Disconnect A from the Mainboard. See Removing the Mainboard on page 85. 3. Turn the Mainboard right side up, and place it on a clean surface. 4. Using tweezers, grip the cable connector and disconnect the Fan cable from the Mainboard. IMPORTANT Do not grip the cable itself to prevent stripping. Mainboard 7. Lift the Fan module clear of the Mainboard. 7. Lift the Fan module clear of the Mainboard. Connect the Fan cable to the Mainboard. 3. Connect the Fan cable to the Mainboard. 1. Ensure that the Mainboard is face up (the Heatsink and CPU are not visible). Place the Mainboard in the chassis, rear edge first, and press down to install. Replace the two securing screws as shown. NOTE Make sure the I O ports are positioned correctly through the lower cover, and the screw sockets are visible through the mainboard. 2. Replace the two securing screws on the mainboard. 3. Connect the ExpressCard and Bluetooth cables attached to the mainboard. 3. Connect the ExpressCard and Bluetooth cables attached to the mainboard. IMPORTANT The disassembly procedure described in this chapter is a gradual process, as illustrated in the flowcharts preceding each disassembly stage section. 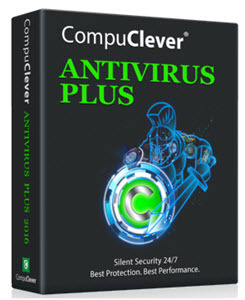 This means that users need to observe the instructions in a step-by step manner. To illustrate, if you want to remove the mainboard, you must first remove the keyboard, then disassemble the inside assembly frame in that order. Failure to observe the gradual process may result in component damage. If an error occurs with the internal diskette drive, reconnect the diskette connector on the system board. If the error still remains If an error occurs, reconnect the connector on the System board. 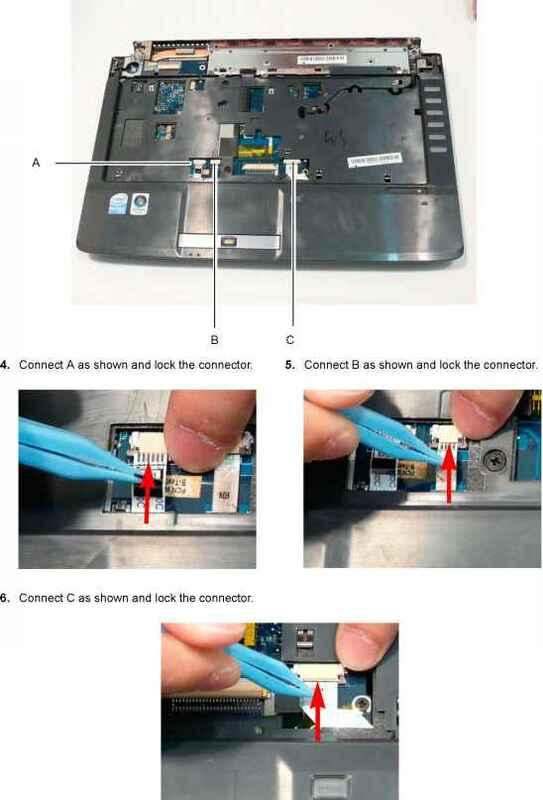 If the error still remains If the internal keyboard does not work or an unexpected character appears, make sure that the flexible cable extending from the keyboard is correctly seated in the connector on the system board. NOTE Perform the FRU replacement or actions in the sequence shown in FRU Action column, if the FRU replacement does not solve the problem, put the original part back in the computer. Do not replace a non-defective FRU. Replace the USB cable under the mainboard as shown. 4. Ensure that the Mainboard is face up. Place the Mainboard in the chassis, rear edge first, and press down to install. NOTE Make sure the I O ports are positioned correctly through the lower cover, and the screw sockets are visible through the mainboard. 1. Align the screw sockets and replace the modem 2. Replace the two securing screws. module and insert the module in mainboard. Ensure that the Mainboard is face up (the Heatsink and CPU are not visible). Place the Mainboard in the chassis, rear edge first, and press down to install. Replace the two securing screws as shown. 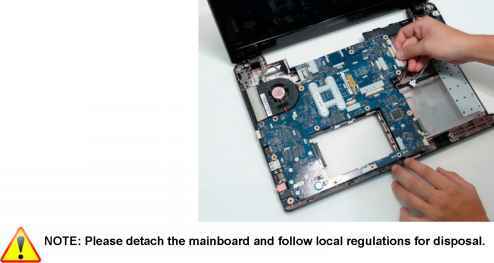 NOTE If any resistance is met while installing the mainboard, ease the computer case outward to clear the obstruction. 2. Replace the three connectors in the Mainboard sockets as shown. 2. Replace the three connectors in the Mainboard sockets as shown. 3. Secure the Mainboard to the chassis using the two screws provided. 1. 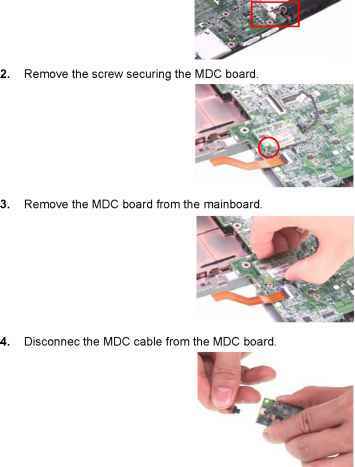 Ensure that the three LCM Module cable pass through the Mainboard and are accessible from the underside of the computer. Place the three cables in the wiring conduit and secure in place using the cable pins on the chassis. Disconnect the power cable from the mainboard. 14. Disconnect the LID switch cable from the mainboard. 15. 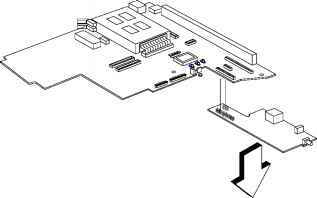 Disconnect the audio DJ cable from the mainboard. (Aspire series only) 14. Disconnect the LID switch cable from the mainboard. 15. Disconnect the audio DJ cable from the mainboard. (Aspire series only) 17. Disconnect the MIC wire cable from the mainboard. 18. Unlatch the touchpad board FFC and disconnect the touchpad board FFC from the mainboard. 17. Disconnect the MIC wire cable from the mainboard. 18. Unlatch the touchpad board FFC and disconnect the touchpad board FFC from the mainboard. To replace the battery, pry the existing battery out of the Mainboard and press a replacement down firmly in to the socket. 4. Connect the Mainboard FFC to the TouchPad Board and close the locking latch. 4. Connect the Mainboard FFC to the TouchPad Board and close the locking latch. Remove the six securing screws from the Mainboard. Mainboard (red callout) Mainboard (green callout) 5. Ease out the casing to release the I O ports from the rear of the chassis and lift the mainboard upward. 5. Ease out the casing to release the I O ports from the rear of the chassis and lift the mainboard upward. 6. Remove the mainboard from the chassis, in the direction of the arrow, and place it on a clean, dust-free surface. 1. See See Removing the Mainboard on page 71. 1. See Removing the Mainboard on page 71. Insert the Graphics Card into the Mainboard connector. 4. Insert the single screw to secure the Graphics Card to the Mainboard. 4. Insert the single screw to secure the Graphics Card to the Mainboard. 4. Replace the two (2) screws (in numerical order from 1 to 2) to secure the Graphics Card Heatsink to the Mainboard. Mainboard then replace the module. Keep the module as level as possible to spread the thermal grease evenly. Mainboard then replace the module. Keep the module as level as possible to spread the thermal grease evenly. 4. Connect the fan cable to the Mainboard. 4. Connect the fan cable to the Mainboard. 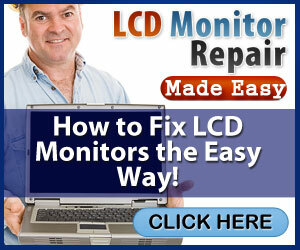 Disconnect the LCD cable from the Mainboard and remove the cable from the cable channel. 5. Disconnect the LCD cable from the Mainboard and remove the cable from the cable channel. 4. 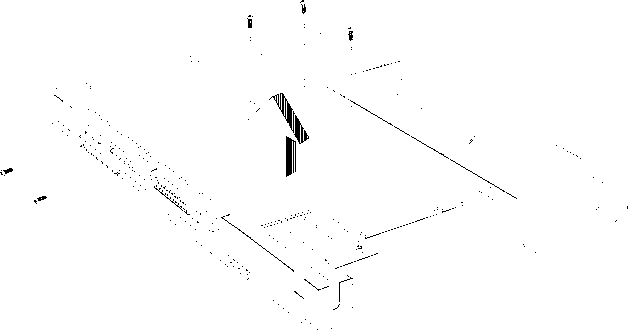 Disconnect the following four cables from the Mainboard, labeled A,B,C and D. 2. Remove the one (1) securing screw from the Mainboard. Mainboard 3. Lift the mainboard from the chassis, internal edge first, and place it on a clean, dust-free surface. 3. Lift the mainboard from the chassis, internal edge first, and place it on a clean, dust-free surface. The RTC Battery is soldered to the Mainboard. To replace the battery, solder the new battery to the connections shown. 3. Using both hands, lift the Thermal Module clear of the Mainboard. 3. Using both hands, lift the Thermal Module clear of the Mainboard. 2. 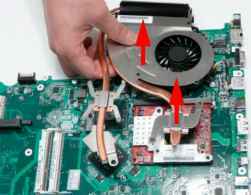 Disconnect the Fan cable from the Mainboard as shown. 4. Lift the CPU Fan clear of the Mainboard as shown. Disconnect the Backlight cable by opening the FFC latch and removing the cable from the Mainboard. 5. Disconnect the Backlight cable by opening the FFC latch and removing the cable from the Mainboard. 6. Disconnect the Keyboard cable by opening the FFC latch and removing the cable from the Mainboard. 6. Disconnect the Keyboard cable by opening the FFC latch and removing the cable from the Mainboard. 5. Open the Power Board FFC locking latch and disconnect the FFC from the Mainboard. 5. Open the Power Board FFC locking latch and disconnect the FFC from the Mainboard. 7. Disconnect the Microphone cable from the Mainboard. 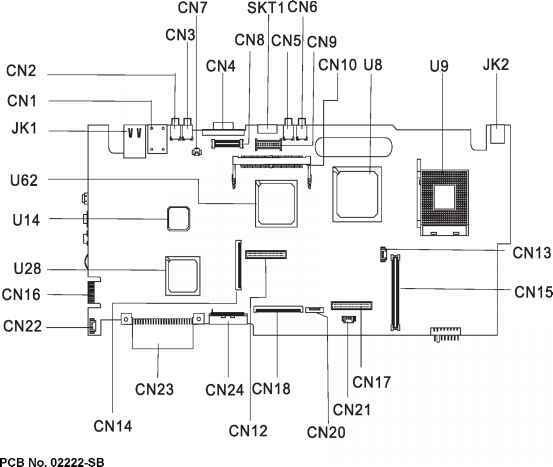 Open the locking latch on the FFC and disconnect it from the Mainboard. 2. Disconnect the Speaker and Subwoofer cables from the Mainboard. 3. Remove the three screws securing the Mainboard to the Lower Cover. 3. Remove the three screws securing the Mainboard to the Lower Cover. Mainboard 4. Pivot the Mainboard upward and remove it from the chassis, right side first. Place the Mainboard on a clean, dust-free surface. Disconnect the wire cable from the mainboard . Detach the thermal board and disconnect the thermal cable from the mainboard. 9. Take the MDC board out from the mainboard with plastic flat screwdrive tool. 13. 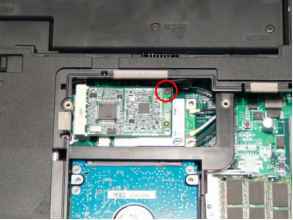 Disconnect the touchpad FPC from the mainboard. 20. Remove the one screw to release the mainboard. 22. Detach the mainboard out from the chassis. 25. Detach the PCMCIA from the mainboard. Connect the DC IN Cable 2. Connect the I O Cable to the Mainboard. to the Mainboard. 4. Ensure that the Mainboard is face up (the Heatsink and CPU are not visible). Place the Mainboard in the chassis, rear edge first, and press down to install. Replace the two securing screws as shown. 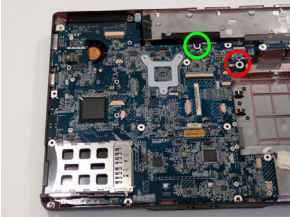 NOTE Make sure the I O ports are positioned correctly through the lower cover, and the screw sockets are visible through the mainboard. Open the FFC locking latch and remove the FFC from the Mainboard. 3. Open the FFC locking latch and remove the FFC from the Mainboard. 3. Lift the Modem Module clear of the Mainboard as shown. 3. Lift the Modem Module clear of the Mainboard as shown. 3. Disconnect the cable from the Mainboard and remove the adhesive tape to free the cable. 5. 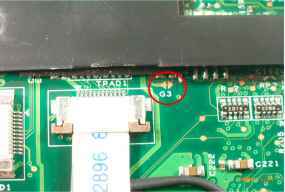 Grasp the RJ-11 cable and remove it from the Mainboard as shown. Mainboard 7. Lift the mainboard right side first to remove from the base. 1. See Removing the Mainboard on page 88. 1. See Removing the Mainboard on page 88. 2. Turn the Mainboard over and place on a clean surface. 3. Hold the fan cable connector and lift to disconnect from the mainboard. WARNING To prevent damage to the Thermal Module or the CPU, hold and lift the Thermal Module by lifting both ends up and away at the same time. 5. Hold the module on both sides and lift it clear of the Mainboard. Remove it from the mainboard as shown. 3. Lift the board to expose the USB LED Power board to mainboard cable. 3. Lift the board to expose the USB LED Power board to mainboard cable. 1. Remove the mainboard. See Removing the Mainboard on page 54. 4. Disconnect the speaker to mainboard cable. Mainboard 6. Grip the mainboard and remove. Remove the screw securing the power board to the system board, and set it aside. 4. Disconnect the bluetooth cable from the routing channels with the tapes following system board. 8. Pull up on the keyboard connector pull-tab to disconnect the keyboard connector from the system board. Disconnect the function key board cable from the MMB1 connector on the system board. 13. Disconnect the function key board cable from the MMB1 connector on the system board. Disconnect the power button cable from the BTB2 connector on the system board. 15. Disconnect the speaker cable from the SPK1 connector on the system board. Disconnect the right speaker cable from USB cable and disconnect the USB cable from the mainboard. 6. Disconnect the left speaker cable from the mainboard. 7. Disconnect the Audio cable from the mainboard and remove the audio cable from the audio board. 8. Remove the four screws that secure the mainboard. 9. Detach the mainboard from the lower case assembly. 11. Disconnect the MDC cable from the mainboard. 13. Remove the MDC module from the mainboard. 15. Disconnect the fan cable from the mainboard. 19. Remove the CPU from the mainboard.